One of my morning sources is the email alert from RRW. It includes two items from the relatively obscure Google Labs - i.e. that corner of the Goolezone where new applications are announced and given a shove into the world. Note, I'm not saying released "in beta", because, Google, like the best of the innovation web, isn't too fond of the beta word any more - we are after all in the zone of the 'perpetual beta'. Which by the by, has always been my definition for life! As the image shows, Google News Timeline is a way of looking at news within a time line sequence. The additional promise is that you can customise the search with a set of sub queries which match your current preferences, or research/story needs. Also, in theory, you can bring in magazines, blogs, tv, video. There is also an attempt to go wider with a feature which links to some Wikepedia events. The verdict? Nah - it's not ready for me. Sure, the idea is a compelling one - especially if you can get the contextual sources running in sync. It would also be good if you run it as a broad banner at the foot of the browser, say as a Firefox plugin. 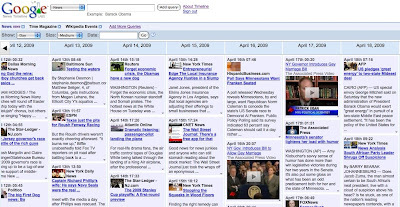 In practice, when I went I tried to personalise it with the customised search feature - ['add more queries'] - though there was a little moment of pride that it found this blog, it failed to let me add any mainstream New Zealand newspapers - or any of the outside the USA big brand magazines, or supplements in the likes of The Times Literary Supplement, et al, or even the New York Review of Books. Actually it didn't even find the New York Times! The screen interface is way too busy. I was google-eyed trying to figure out the options. Which was interesting in its own way. We are so used to hearing people want search screens to be "more like Google" . Well looks like the boys from the search- hood have their own issues with managing complexity. Welcome to my/our world Master Google. Try it for yourself, here.